But University of Utah researchers may have found a way to greatly reduce the difficulty of predicting formation of clouds. The results, published today in Journal of Geophysical Research-Atmospheres could fill a key gap in scientists’ understanding of how climate change may play out. Clouds, particularly those in the tropics, are part of the Earth’s system for getting rid of excess heat generated by the sun. That’s why they matter to climate scientists. They’re part of a vertical conveyor belt, lifting hot buoyant air up to an altitude where the heat can be easily radiated into the cold blackness of space. But clouds can play with heat in other ways. Clouds constantly grow and shrink as they exchange air with surrounding dry air. So far, it’s unclear how clouds factor into the effects of global climate change—will clouds slow down warming? Or enhance it? Will warming create more clouds? If so, what regions will be most affected? Let’s go back to the concept of clouds as conduits of heat into the upper atmosphere. A tall, sharp, white cloud is composed of droplets of water, in contrast to the clear, blue, relatively drier air around it. The white, wet clouds and the blue, dry air are in constant contact with each other, sharing a common boundary. It’s this boundary that got Garrett thinking. As water droplets form inside clouds, a little bit of heat is released, making the clouds buoyant in the atmosphere. Garrett says that this makes clouds efficient at their job of lifting heat away from the ground—and also means that the hot, rising air is turbulent and can spill out of the sides of the cloud as it rises. “This realization about clouds as leaky conduits made me think that the place to look for understanding clouds and climate was not their areas looking down, as has commonly been the focus, but instead their edges,” Garrett says. These theoretical results suggest that the complexity of cloud field structures can be viewed statistically as an emergent property of atmospheric bulk thermodynamics. So, what does this mean for climate change modelers who want to know how clouds will react to warming global temperatures? “This is quite speculative,” Garrett says, “but the suggestion of our study is that cloud-climate feedbacks may be small, because tropical clouds will rearrange themselves in a warmer climate so as to continue their currently low impact on surface temperatures.” In other words, while the total amount of cloud cover may go up, the proportions of cloud sizes at different altitudes likely won’t change much. If this model is proven out, climate scientists may be able to breathe a little easier knowing that clouds likely won’t be amplifying global warming. Odd, imputing volition to natural processes. Seems we really haven’t come so far in 12K years. I have recently studied an ISCCP dataset of cloud properties, including temperatures. I’ll not give here a link to that dataset, since I am not sure, if it was published or if I just get to the internals of NOAA servers. Mean cloud temperature, middle clouds, all regions in single chart. Whole goals of climate-change AGW agenda of preventing a century-long increase (of I do not remember how much °C), here happening in a single month? Many other properties in this dataset change abruptly on september 2001. It is very probable, that they have changed, what is middle and what is not middle cloud etc…, thereby getting different cloud-sets into same dataset. Who has ears, listen! Global weather did not change in september 2001, something else did. Hence I will not give a link to the dataset, since it would be compeled to be removed or “corrected“… After all, it was not “published” as a paper-work in a journal, but laid out as numerical files on not-so-much visible server. The post above misses chart picture? The thing that bothers me about clouds is that they are necessarily in local thermal equilibrium with their surroundings, implying that they have no effect on the overall radiation balance at the altitude where they form. Less shortwave reaches the ground, but escape of longwave is correspondingly impeded. Ah, you say, but clouds at higher altitudes are colder so they radiate less longwave downward. But shortwave photons have a low mean free path so that their temperature effect at the surface depends on the lapse rate, just like convection. So, if clouds are to have any effect, a more sophisticated explanation is required. I now await the sophisticated explanations. Clouds change albedo, they are reflecting incoming light out, below a dense cloud it is cold, as everyday experienced. The thin clouds (cirrus) let radiation in but reflect longwave from ground back, therefore cause warming, as also everyday experienced. 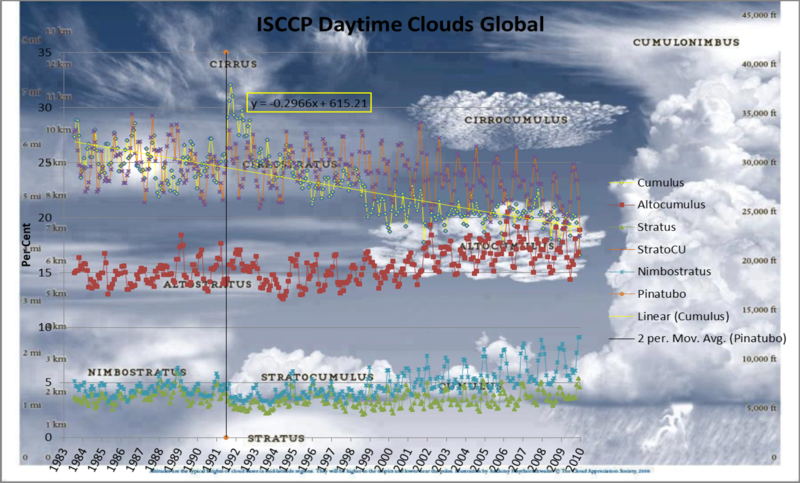 From ISCCP dataset I wanted to learn, how has changed amount of cirrus clouds over time, as possibly seeded by aviation and industry, since that should have much bigger effect on temperatures than all CO2 combined… It’s a pitty that the dataset is poisoned with ad-hoc and abrupt change of cloud classification. Also a note to the article above – not all clouds form naturally and statistically constant. Thin film of cirrus clouds is being seeded anthropologically. Thick clouds – the more heat, the more clouds (mostly from oceans, also from land), making shadow and reducing ground heat, which should lead to a ballance. 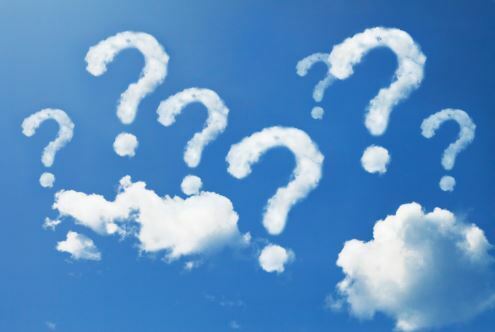 Thin clouds (causing warming) not produced by natural means are different in this. The cloud type that notably declined over the ISCCP dataset was cumulus and to a lesser extent stratocumulus. There are unimpressive increases in altocumulus and nimbostratus since ~2001. ISCCP does not deal with cirrus, and deep convective clouds which they do include are left out here as I was comparing to MODTRAN, which factors cloud types, but not deep convective. 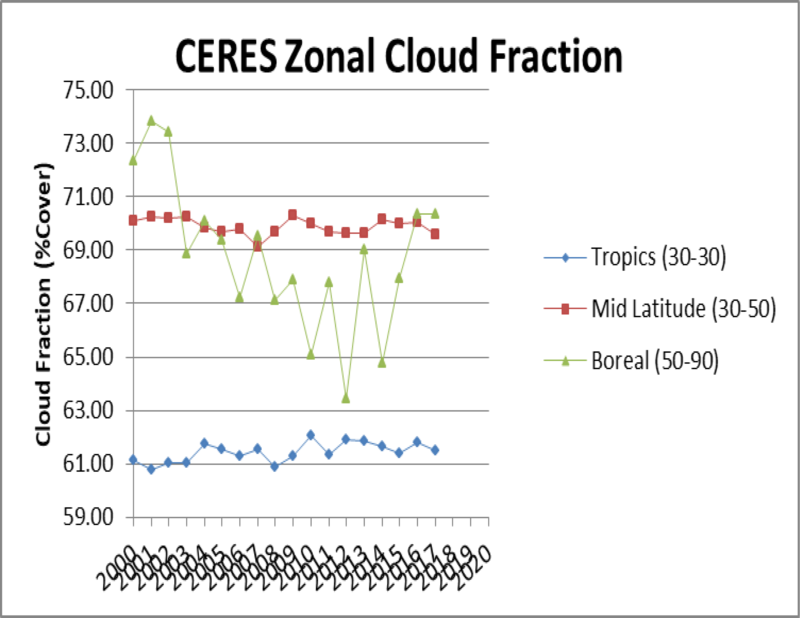 ISCCP was daytime only and the dataset ends in 2009, apparently in favor of CERES cloud fraction, which is either cloud or no cloud. Interestingly, according to ISCCP, deep convective clouds are rare, averaging 5-6% global coverage. Cumulus and stratocumulus each cover more like a quarter of the planet. Half the planet between the two. ‘The product of the number of clouds and their perimeter remains constant.’ Very strange. There are no clouds at the late night, so that constant must be a zero. What is important about clouds is not the clouds themselves but what falls out of them, precipitation. The water cycle removes heat from the surface (heat of evaporation) and deposits it at cloud level (heat of condensation). Because a phase change is involved, heat essentially disappears from the surface and reappears at altitude, where heat is efficiently radiated to space. This process serves to short-circuit the greenhouse effect, and the warmer it gets the faster it goes. Of course clear air convection is also important. Together they supply massive negative feedback which is a powerful stabilizing factor for the environment and, may I say, reduces the so – called “Greenhouse Effect” to almost zero. But when it’s night on one side of Earth it’s day on the other. Most of the recorded warming has happened at night I understand. It does look like its the planes. late dusk in Europe look up at the sky the impact is often more than a few percent from the jet engines. Also remember that all these big conferences are made possible by planes. This is not a welcome conclusion. I think during the 9/11 planeless week a significant outcome was noted. again not welcomed by the ruling class. If so, look at urban heat islands. Not many of those in 1850 when modern warming was getting started after the Little Ice Age. You must remember that the church of climatology must find something to keep the faith alive and the money rolling into the trough. If they can’t then grant money dries up and then what will the faithful acolytes in the universities do then. If you’re looking for an effect of CO2, look when convection is absent, that is, at night. I used to think near the poles in winter, but recently some radiation calculations seem to indicate CO2 has a cooling effect there because it radiates from the stratosphere, so now I don’t know. Any nighttime warming is quickly reversed when the sun comes up. Infrared radiation flows through the atmosphere in all directions, so can flow around clouds – a quick detour at high altitude where the mean free path is large. Only the small (12-14%) that is in the water vapour spectral gap is impeded 50% by 50% cloud cover. I doubt that their cloud models take IR into account at all since the dogma is that what doesn’t pass straight through is “trapped”. Convective heat transfer, often referred to simply as convection, is the transfer of heat from one place to another by the movement of fluids. Convection is usually the dominant form of heat transfer in liquids and gases. Great low over the North Atlantic and high above Western and Northern Europe.